When you have to decide between Lobster or Salmon for your Anniversary dinner, which would you choose? 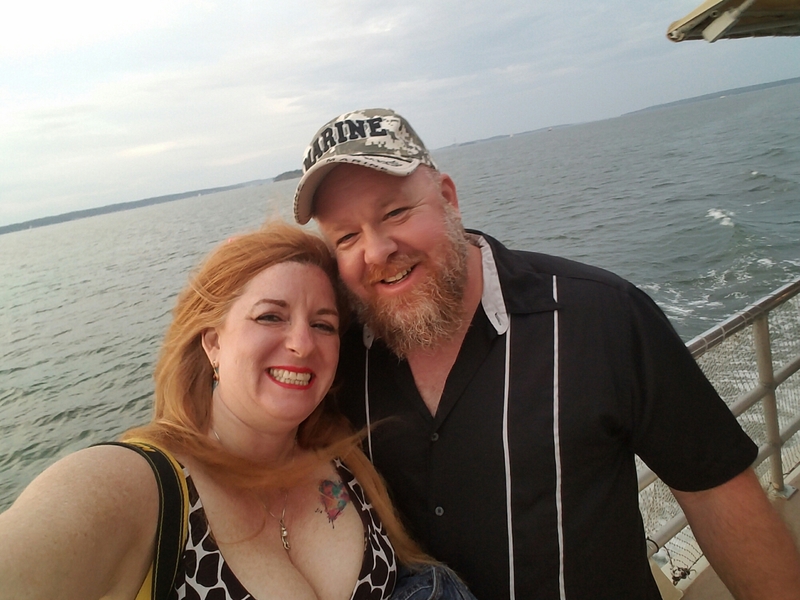 Luckily I have an amazing husband who understands I have a hard time making up my mind sometimes and not only indulges, but sometimes instigates, some of my craziest whims. That’s how we ended up on this epic adventure of a Tale of Two Portlands. We have been wanting to visit Portland Oregon for quite some time, especially since we fell in love with Oregon on our Pacific Coast Road Trip last summer. But Portland, Maine also seemed interesting and I have really been craving lobster for the past few months. With our 26th anniversary approaching, we decided to celebrate by visiting both and comparing and contrasting. Two cities bearing the same name, both on waterfronts, but on opposite ends of the country. Fun Fact: There are 22 cities bearing the name Portland in the United States. 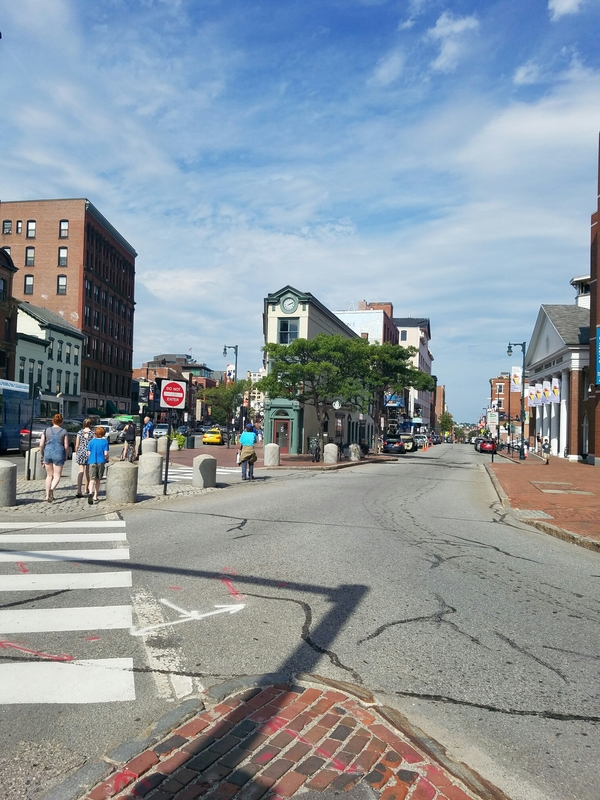 Portland, Maine was the first stop on our adventure, and it certainly did not disappoint. 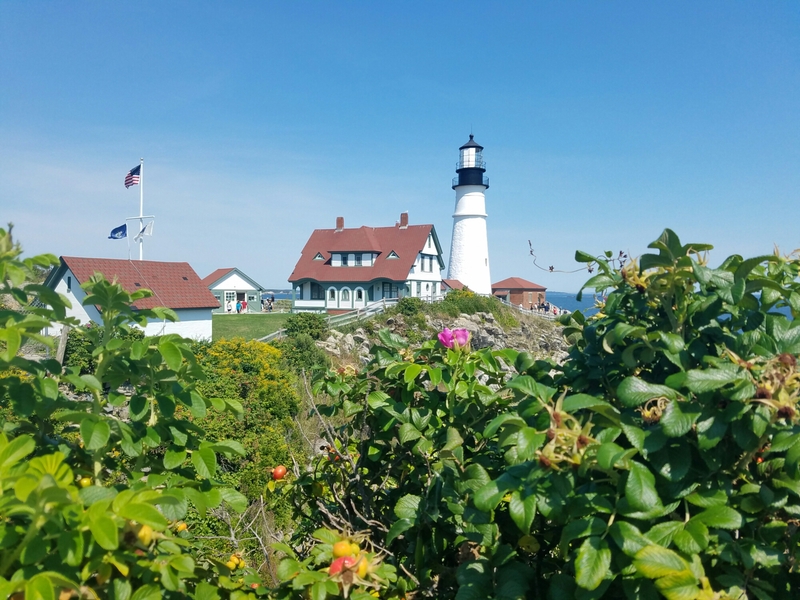 As we are just leaving Portland, Maine to head onto the next segment of our trip, I wanted to share some highlights while they are still fresh in my mind. 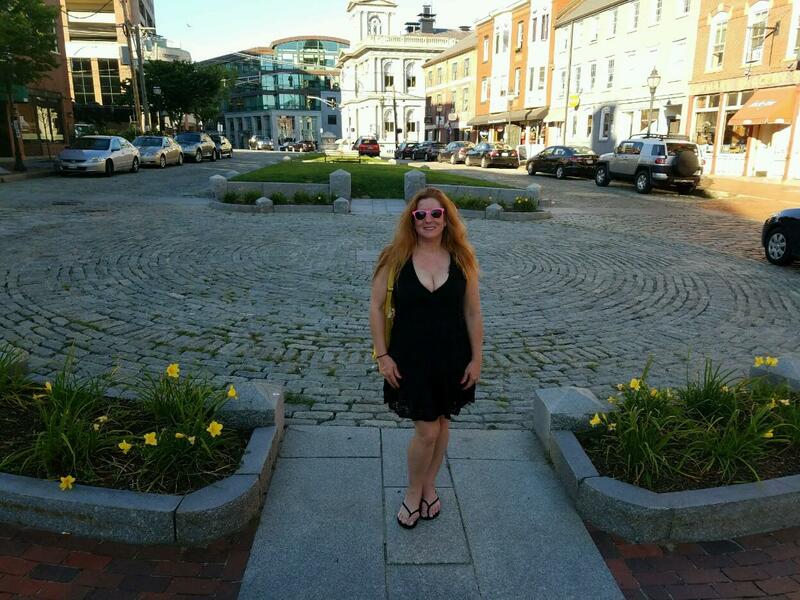 We arrived in Portland, Maine on Monday evening. With a quick Priceline bid while waiting for our baggage, we had a rental car from Budget at a fair price. We were definitely ready to enjoy a nice dinner, but first wanted to check into our room that we booked last-minute through Air BnB. We found the hotels in Portland, Maine to be very pricey, so we reserved a private room in a house in South Portland through Air BnB. Our host Jean was warm, friendly and welcoming. It was a full house, but you would have never known it. She had two adult children who lived with them, and they had company visiting as well, so I almost felt as if we were imposing. However they were all very friendly and greeted us with smiles as we would come and go. The room was clean and although the bathroom was not adjoining, we did have private use of it which was nice. Click here now for $35 off when you book with Air BnB. Our hosts were also very helpful in pointing us in the right direction for sightseeing and really good food. The first night we were there, they recommended a little place in Cape Elizabeth, right along the water, called the Lobster Shack. They don’t serve alcohol, but they do allow you to BYOB, so we stopped at the local grocery store and picked up a couple bottles of pre-chilled white wine on our way. This was probably the most expensive and most lack luster meal of our trip. The lobster roll was packed with meat, but the bun was nothing special, just a cheap hotdog bun with the crust cut off the sides. 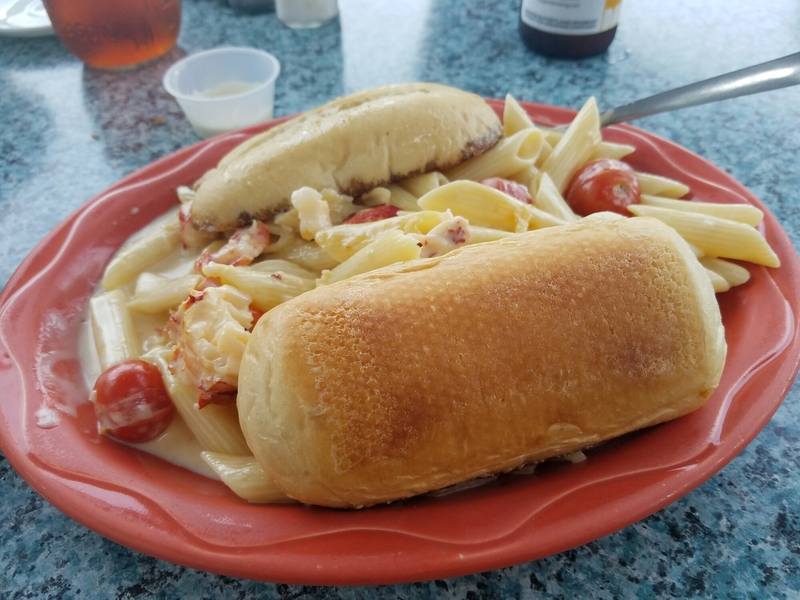 Certainly nothing compared to lobster rolls we have had elsewhere. And the clam chowder seemed to be watered down, not rich and creamy like we like it. 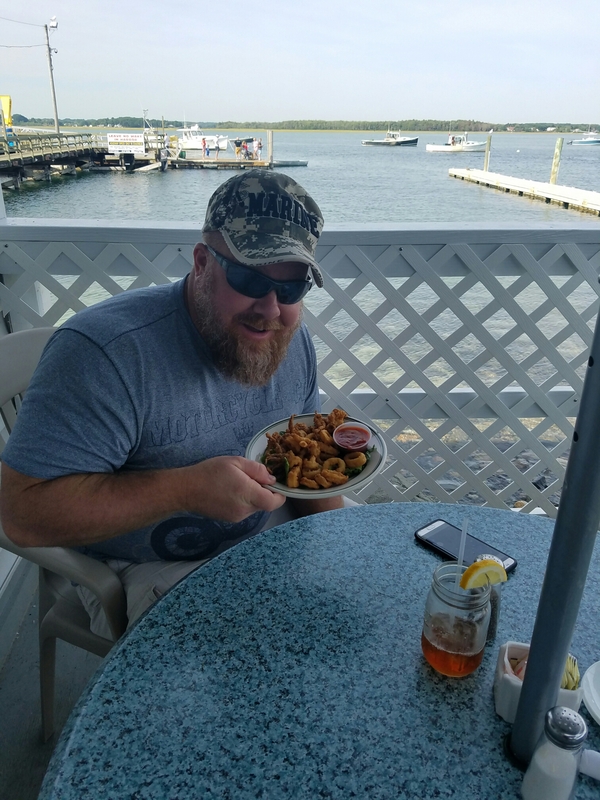 But the fried clams were absolutely delicious and the view of the water at sunset, and the lighthouse off in the distance was delightful for our first night in town. Selfie kisses are the best! Day 2 took us into the city of Portland where we explored Old Port. 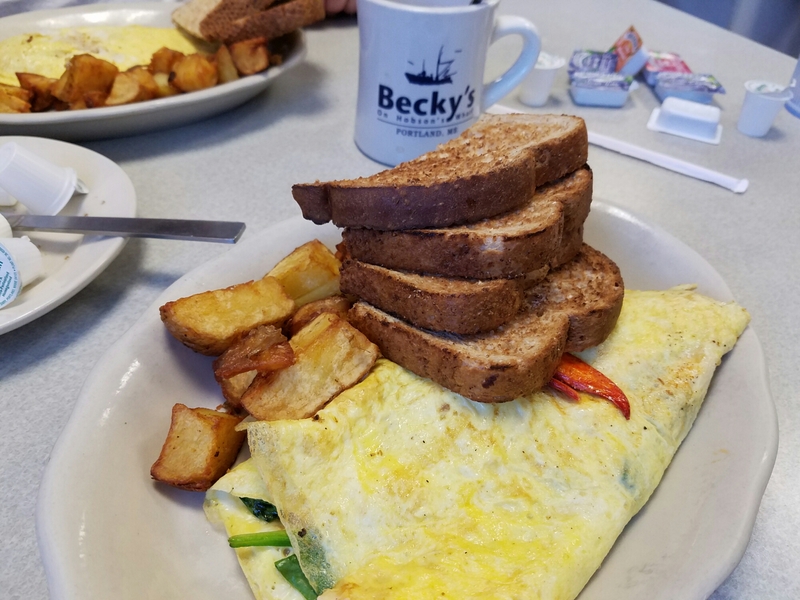 We started with breakfast at Becky’s Diner. A small hometown diner atmosphere with a big wait. We saw it right after crossing over the bridge from South Portland, and by the looks of the line outside, we were hopeful it would be worth the wait. And it was. We could see right away why it is a favorite amongst both locals and tourists. They were all out of the blueberry muffins Ryan had been hoping to try, but the lemon coconut muffin was pretty good. They cut it in half and grilled it, serving it warm which was a nice touch. And of course the lobster swiss omelet was delicious. After breakfast we headed to the Eastern Promenade and Fort Allen Park. 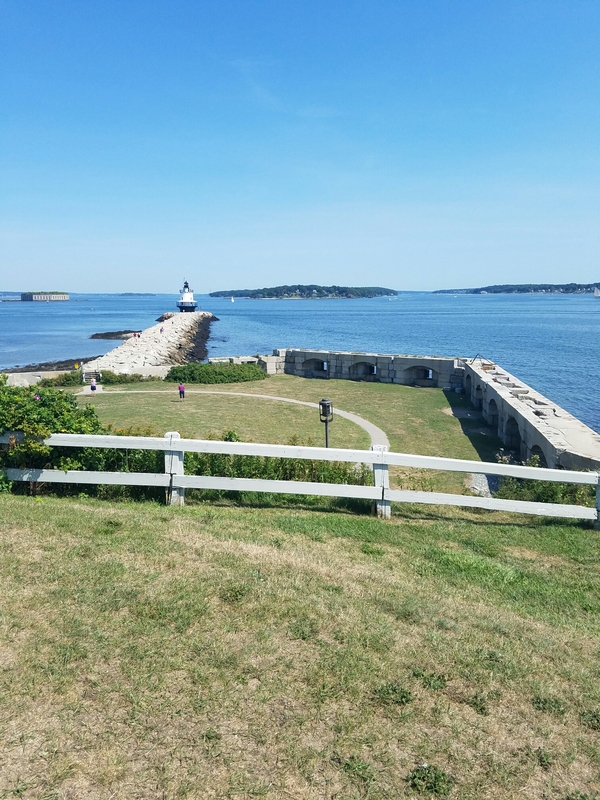 Fort Allen was instrumental in protecting Portland from invading British ships during the war of 1812. Since then it has been turned into a 68.2 acre public park and recreation area in the Munjoy Hill area of Portland. 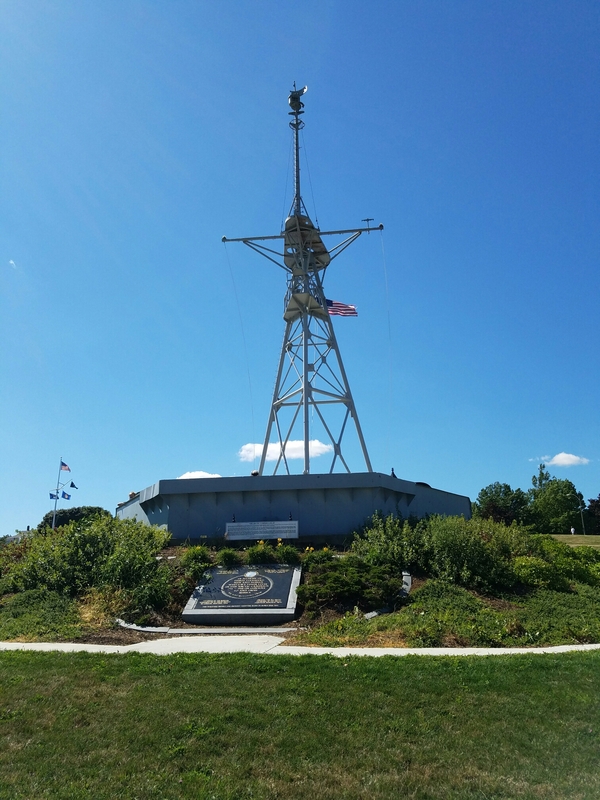 The park features tributes to the Fort’s history as well as monuments to other wars, including the mast of the USS Portland. 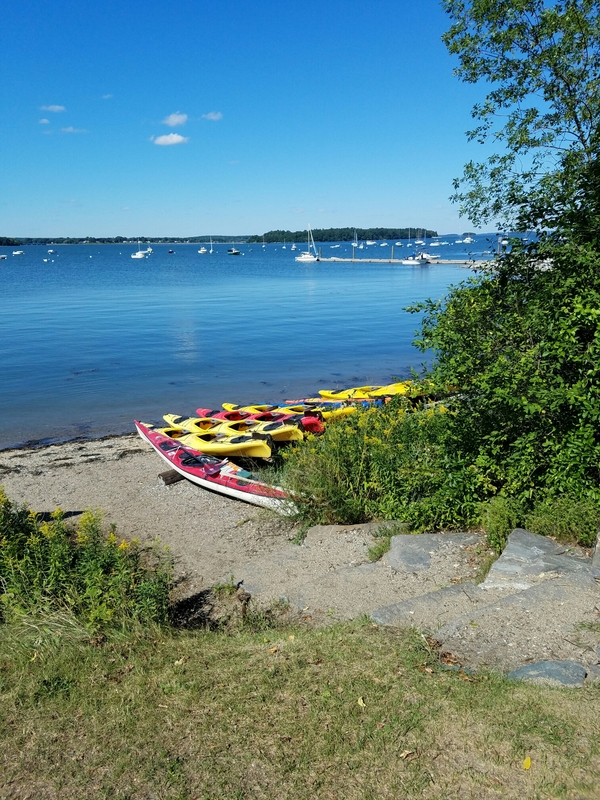 There are also nice paths for walking, jogging or bicycling throughout the park, with beautiful views of Casco Bay. A narrow gauge railroad also runs through the area giving passengers a 40 minute ride along the Eastern Promenade. They offer special event train tours including an Ice Cream Train, Rails & Ales, and a Polar Express. A small public beach area and a public boat ramp round out the park. You can even rent kayaks and stand-up paddleboards. 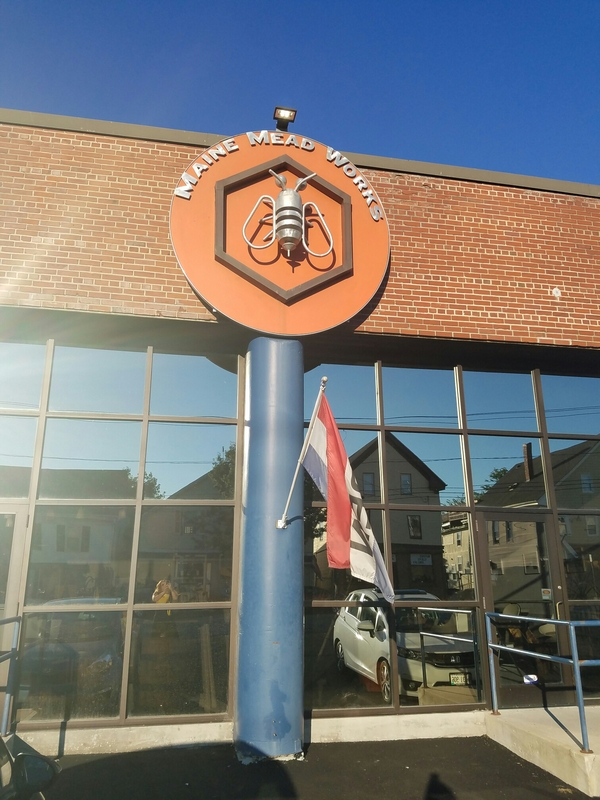 After walking around the Eastern Promenade, we decided to try a tasting of some local honey mead at Maine Mead Works. 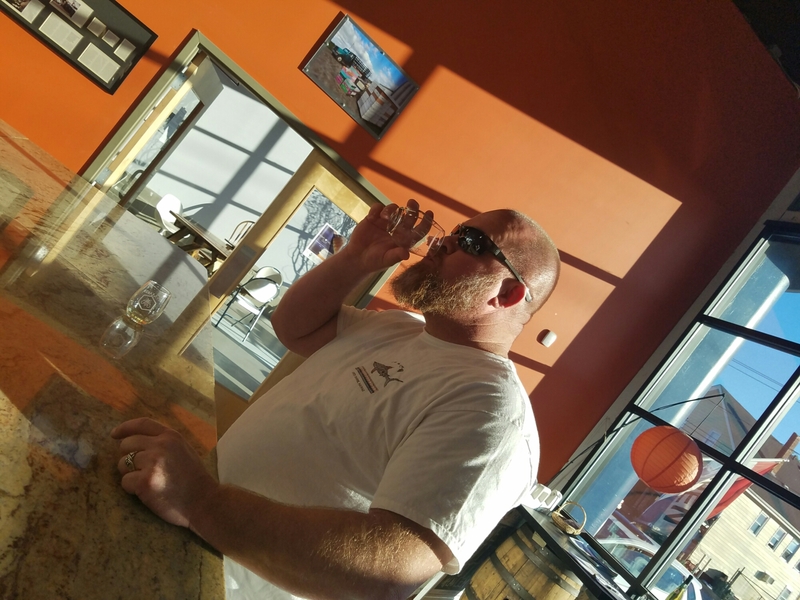 Ryan has been making honey mead at home, and this is the first mead tasting room we have been to, so we were eager to compare. 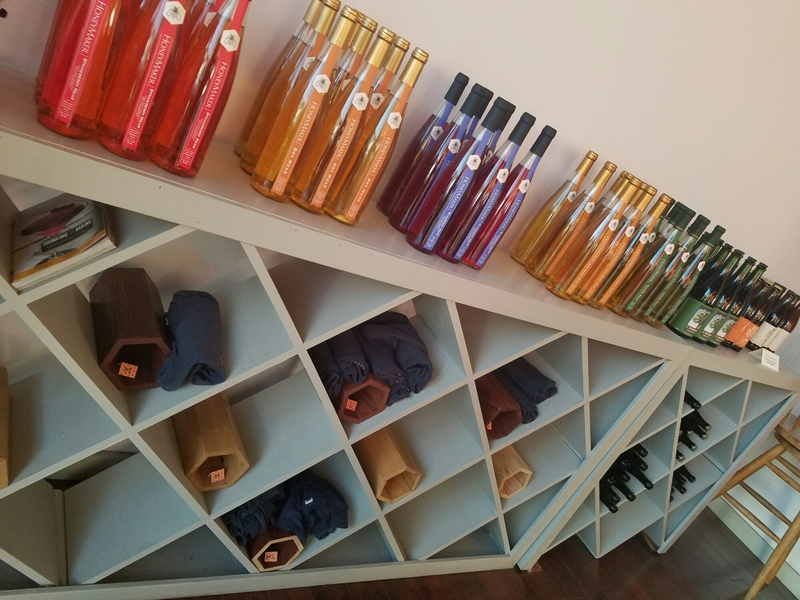 The tasting offered a nice selection of honey mead ranging from dry to sweet. Seasonal varieties included a strawberry mead, and a hopped mead. They also had an interesting iced tea mead that had brought in another couple from Arizona that we enjoyed our tasting with. The woman had tried it at a local restaurant and was intrigued to see what else they offered. We noticed after our tasting that several of the local restaurants featured their meads on their drink menus. 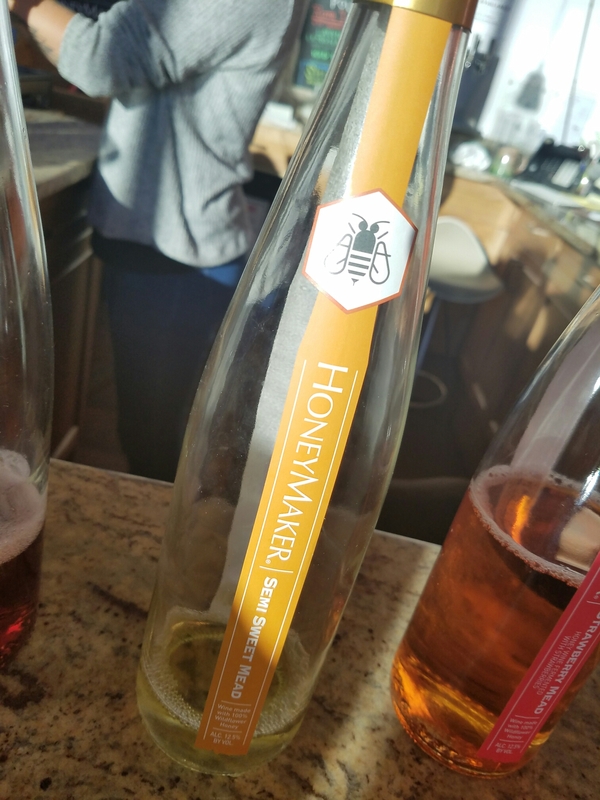 Our favorite of the meads we tasted was the HoneyMaker Semi-Sweet. They also had a very tasty hard apple cider that you can enjoy on tap in their tasting room, or by the bottle. 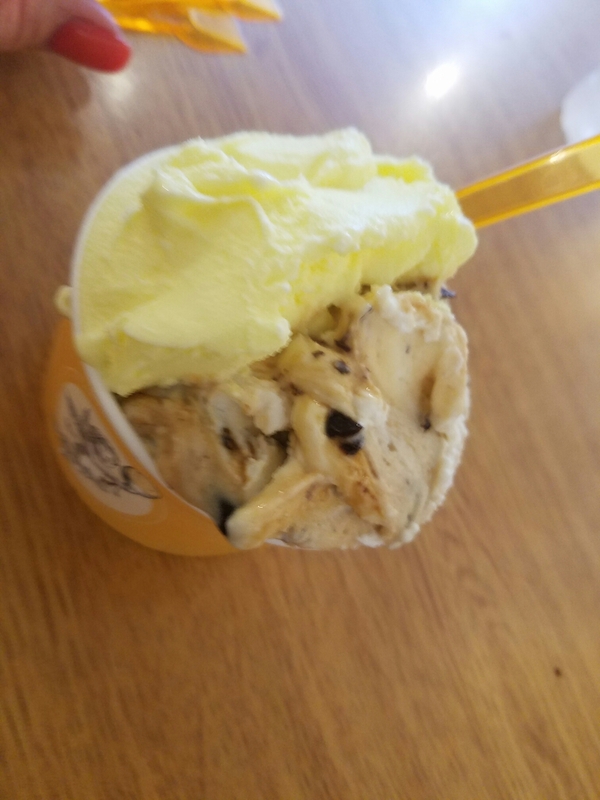 After our tasting we headed back to Old Port, where we happened upon an amazing little gelato place called Gorgeous Gelato. Owned by an Italian couple who have been schooled in the art of gelato making, they use only fresh, natural ingredients to make their velvety smooth treats. I tried two of their 16 flavors. The Gorgeous was filled with chocolate and caramel goodness, and the Lemoncello was bright and refreshing. It was truly a taste of Italy. 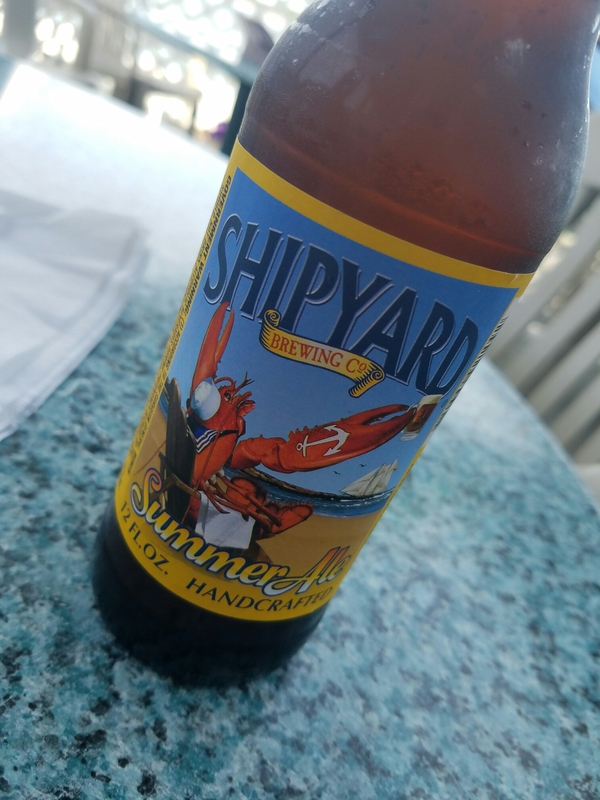 This tasty treat was just what we needed to tie us over until dinner as we walked around the shops in Old Port and looked at the boats down by the pier. 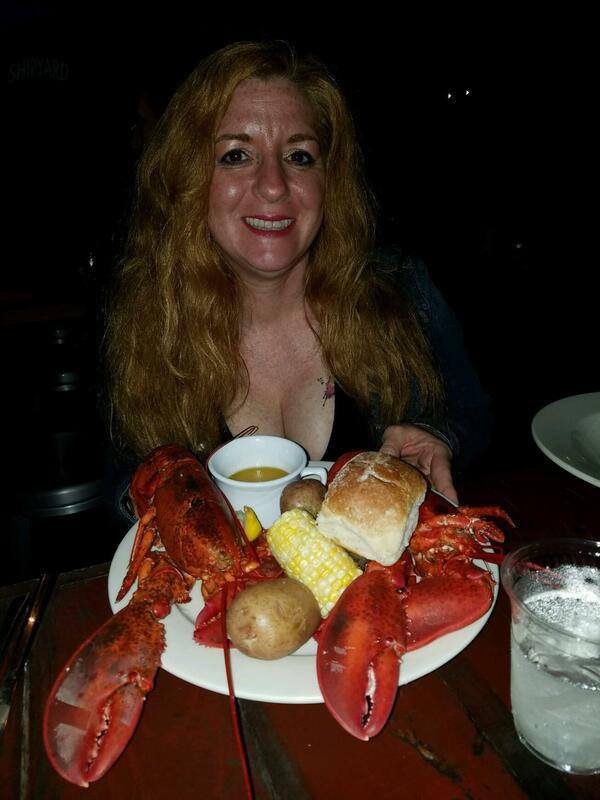 We ended the day with dinner at the Porthole Restaurant & Bar where they had a delicious twin lobster dinner for just $24.95. 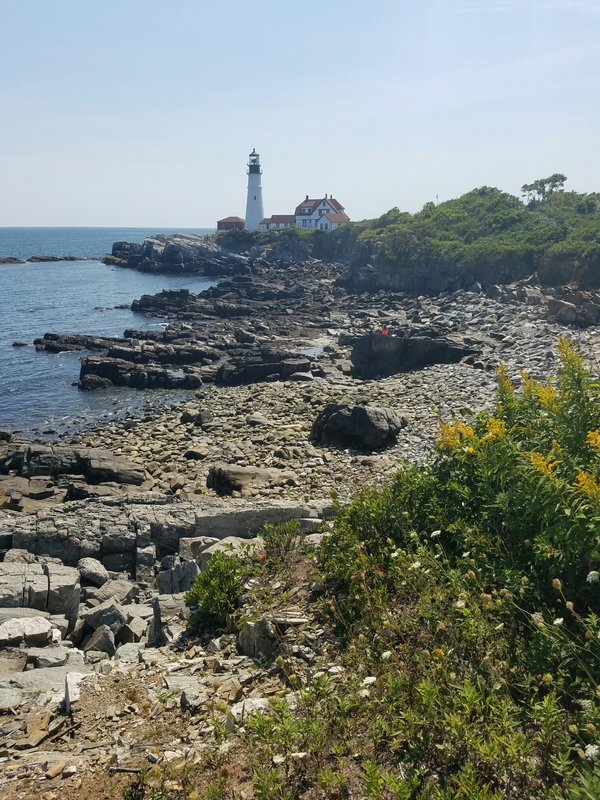 Day 3 of our trip took us on a tour of South Portland, Cape Elizabeth and Scarborough. 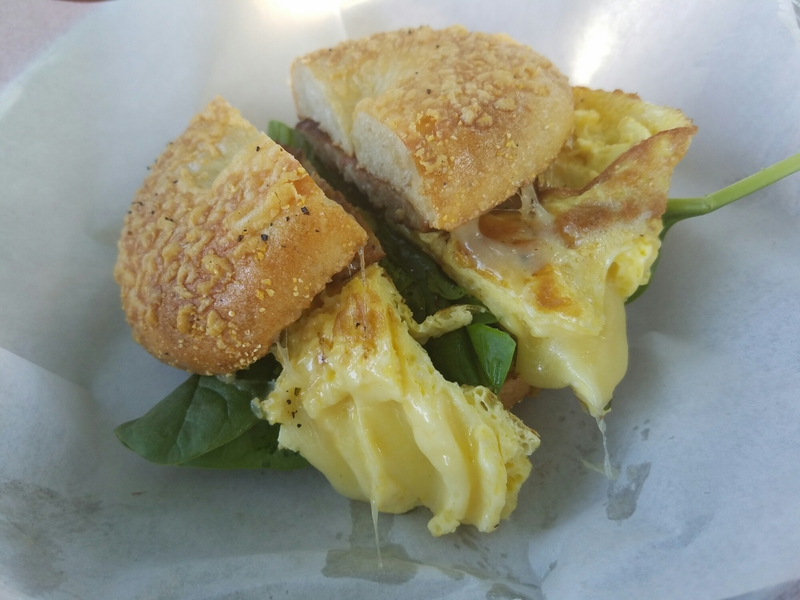 We started the day with breakfast bagels and coffee at 158 Picket Street Cafe. The service at this quirky little cafe was friendly and upbeat. 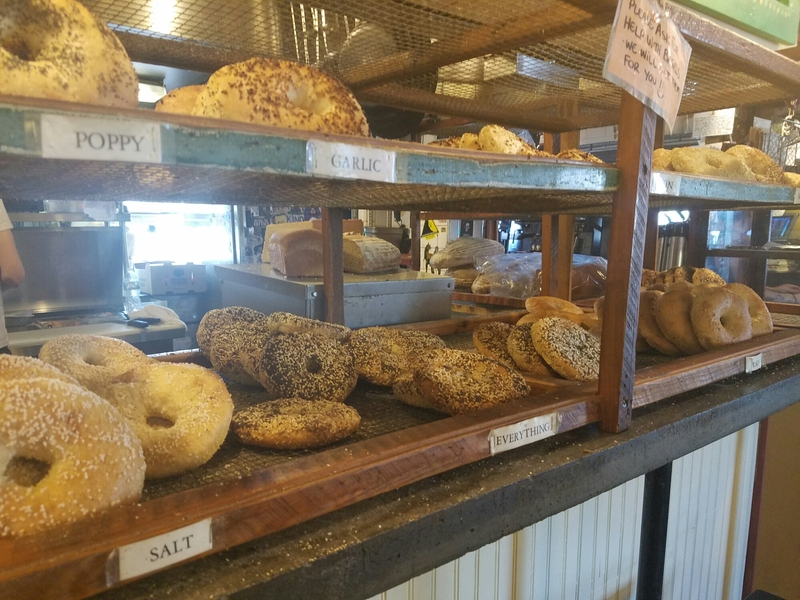 We enjoyed handmade bagels, topped with fresh ingredients in their cozy little backyard garden. Our first stop after breakfast was Fort Preble and the Spring Point Ledge Lighthouse. Fort Preble is the remains of an old military fort originally built in 1808. 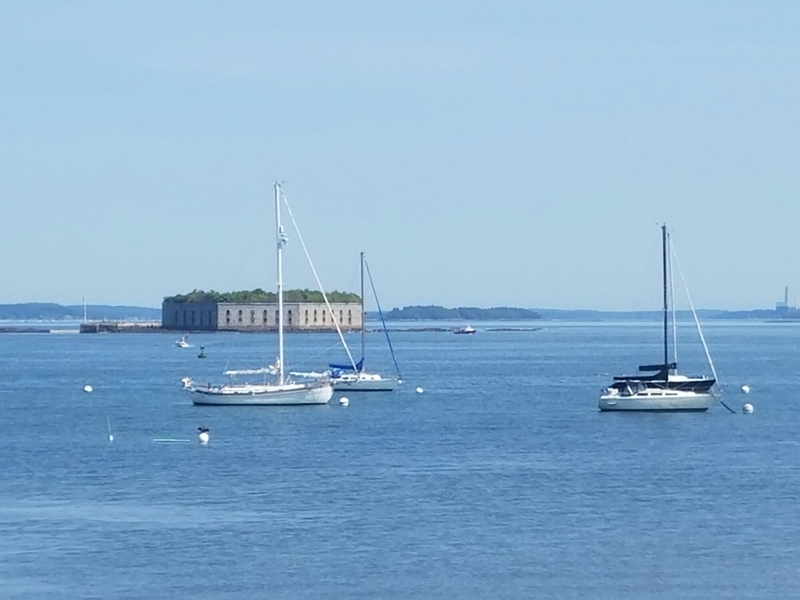 This Fort, unlike Fort Allen, still stands on the shores of the Casco Bay. Although no longer in use, the fort was updated, and added to into the 1900’s. 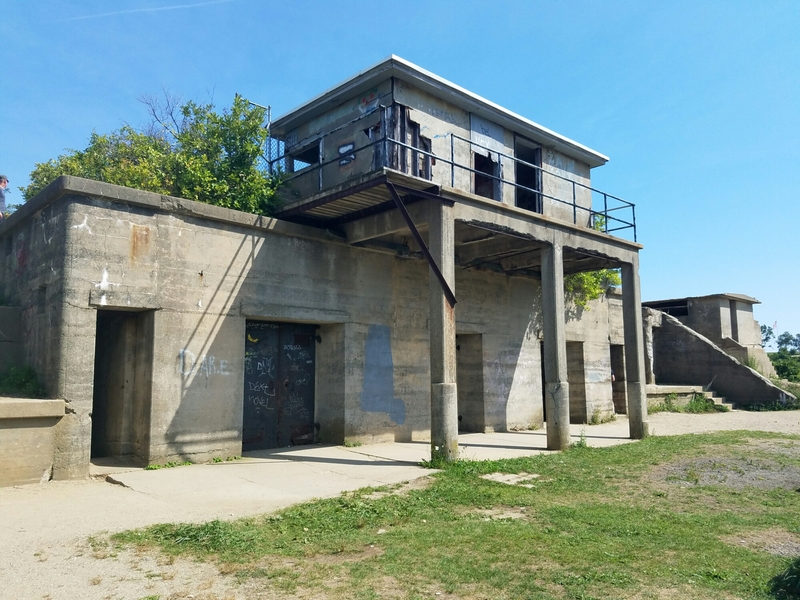 Today the fort is part of a college campus and serves as a reminder of the strong military presence that was needed to protect this bay from enemy forces through multiple wars including the War of 1812, the Civil War and World War I. 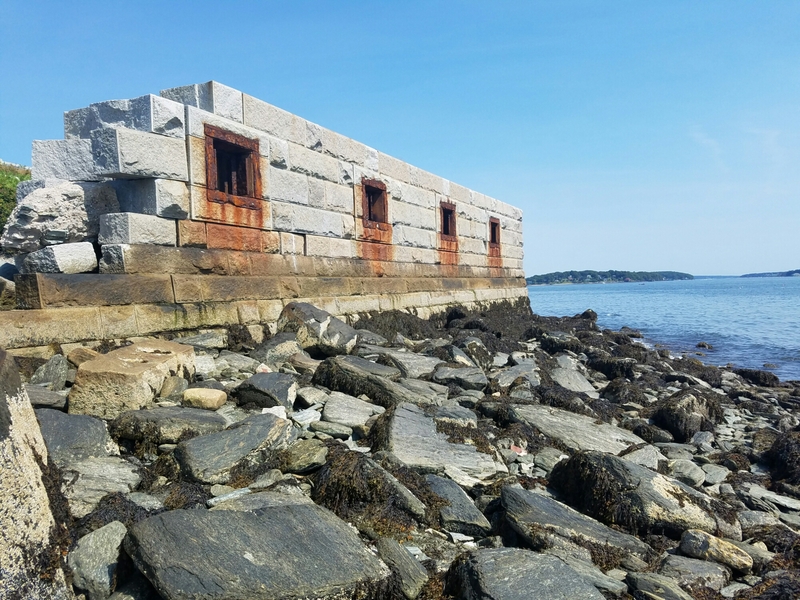 From Fort Preble, you have an excellent view of Fort Gorges which stands alone in the center of the harbor on a small rocky island. 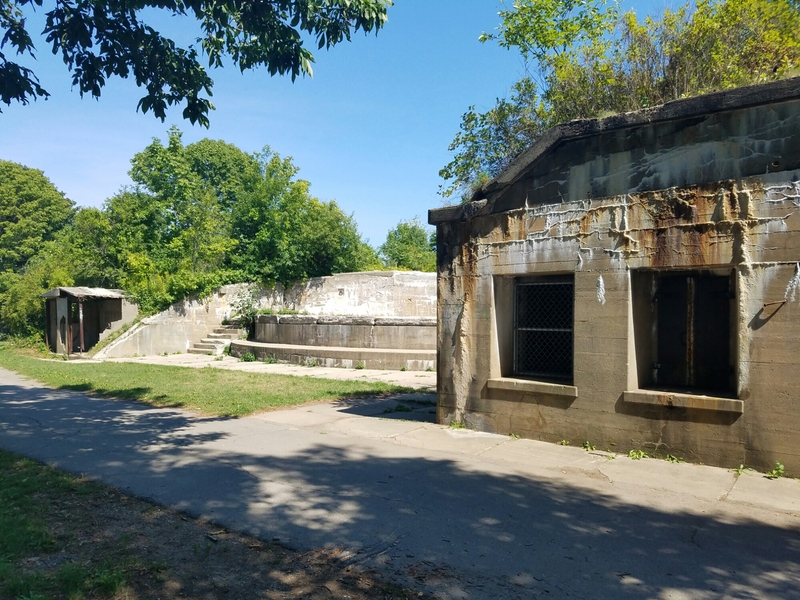 Now overgrown with trees, Fort Gorges was also part of the military defenses that protected Casco Bay and Portland. The way these and other old forts were placed around the bay, made it nearly impossible for enemy ships to enter the bay. 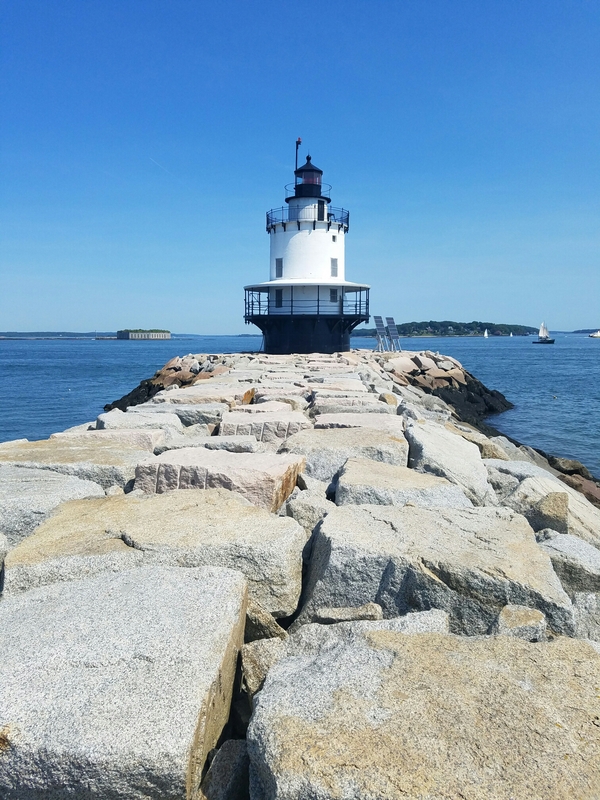 The Spring Point Ledge lighthouse was built in 1897 to help prevent ships from running aground on Spring Point Ledge. It had since been connected the main land by a 900 foot granite breakwater. From here you can also see the nearby Bug Light lighthouse. From here we headed south on Shore Road toward Cape Elizabeth and Fort Williams Park. 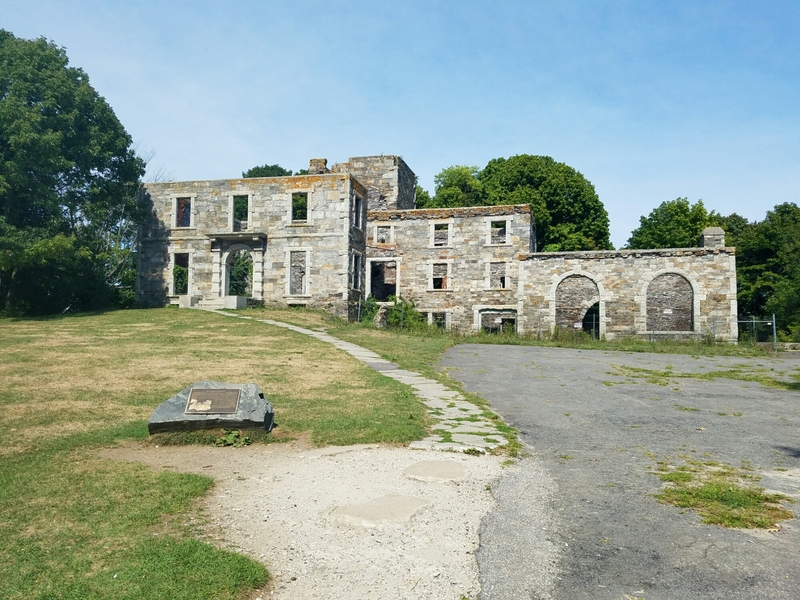 Fort Williams Park made Fort Allen Park seem small with it’s 90 acres of trails, picnic facilities, and historic structures, including the remains of Fort Williams batteries and bunkers, the Portland Head Lighthouse and the Goddard Mansion. 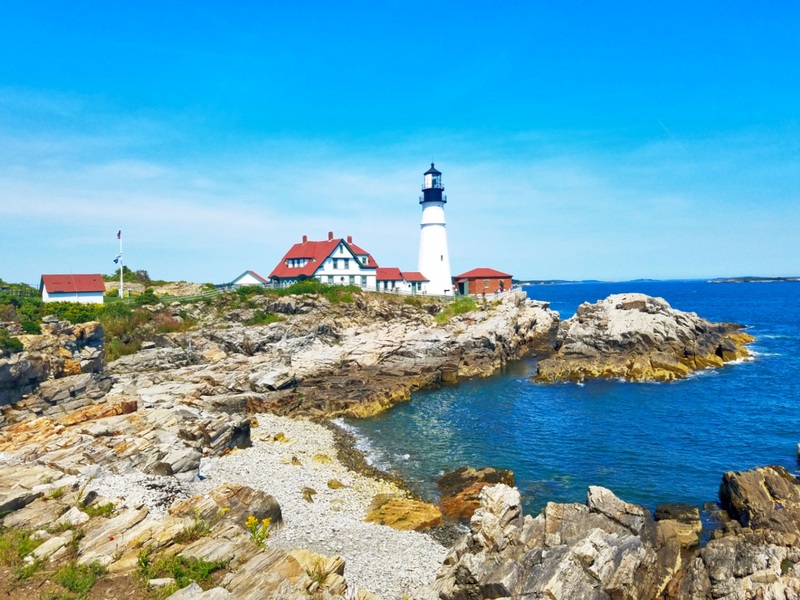 With its first lighting on January 10, 1791, the Portland Head Lighthouse has the notoriety of being the oldest lighthouse in the state of Maine. Since then, the lighthouse has seen many renovations including altering it’s height multiple times. Originally 72 feet from base to lantern deck, the light now stands 80 feet above ground and 101 feet above the water. While still in use, the light is now automated and the grounds and keeper’s house serve as a museum and gift shop. Fort Williams was an Army fort that was operational from 1872 to 1964, serving as a military stronghold throughout World Wars I and II. 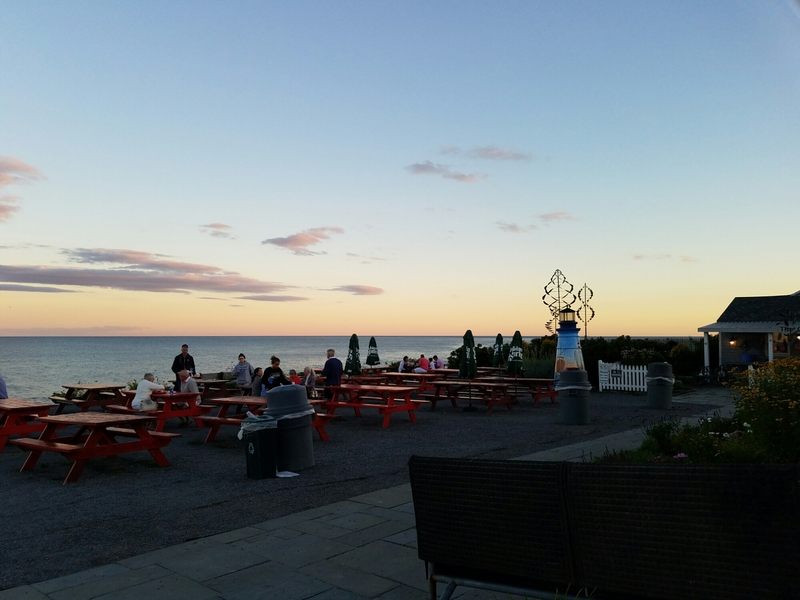 Now owned by the Town of Cape Elizabeth it has been converted unto a public park space. The fort originally had three batteries. Three additional batteries were added between 1903 and 1906 for a total of six batteries. 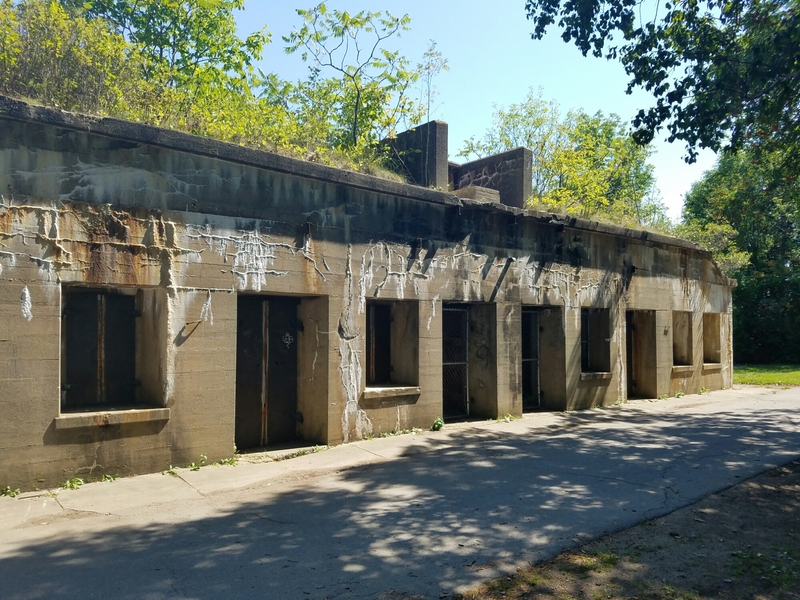 Many of the buildings, bunkers and batteries at Fort Williams Park are no longer intact, but their remnants serve as a reminder of the military presence that was once strong here. 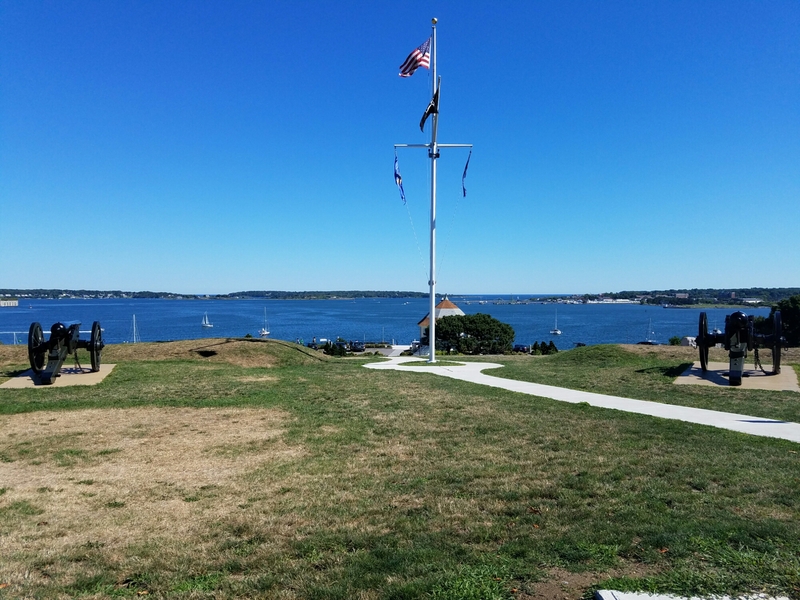 Battery Blair now serves as a memorial to Fort Williams. Battery Keyes sits abandoned above the beach at Ship Cove as a reminder of the great fort this once was. After a long day of touring historical sites, we had worked up quite an appetite. 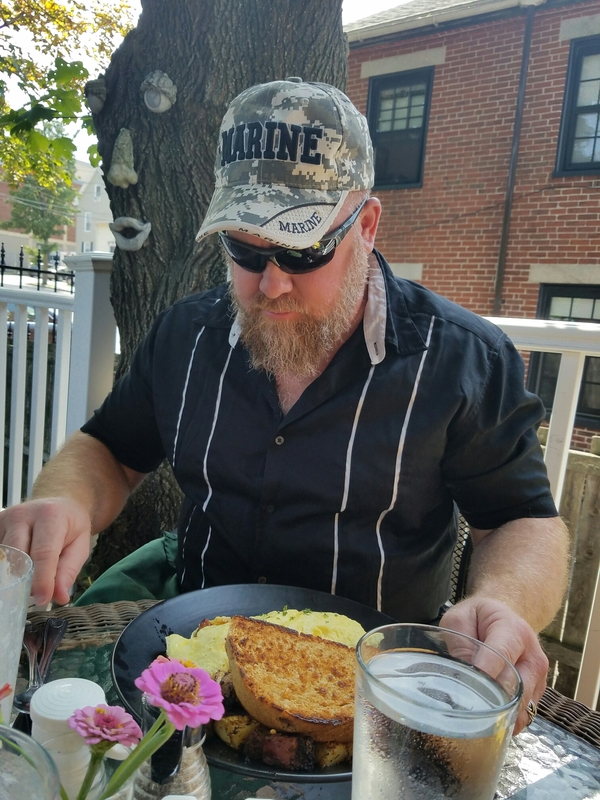 As we continued to drive south, we headed into Scarborough towards a quaint little restaurant at the mouth of the Nonesuch River, called Rising Tide Restaurant. They had outstanding reviews and we were not at all disappointed. 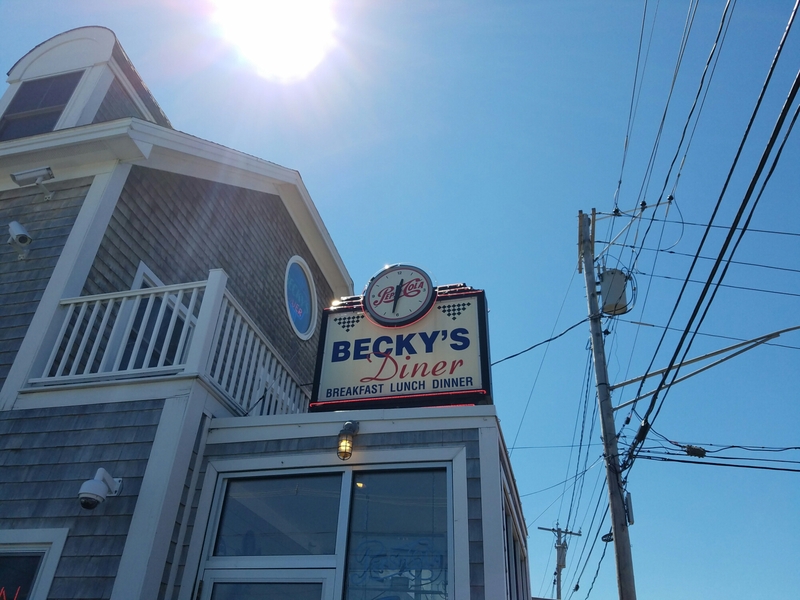 This friendly little dockside restaurant isn’t anything fancy, nut the food us sure to please. It sits overlooking the water, behind the local fisherman’s cooperative, and beside a public boat ramp. Plastic tables and chairs adorn their small patio space where we sat watching as boaters came and went. After starting off with the perfectly cooked calamari, I thoroughly enjoyed the rich creamy goodness of the Lobster Mac & Cheese. 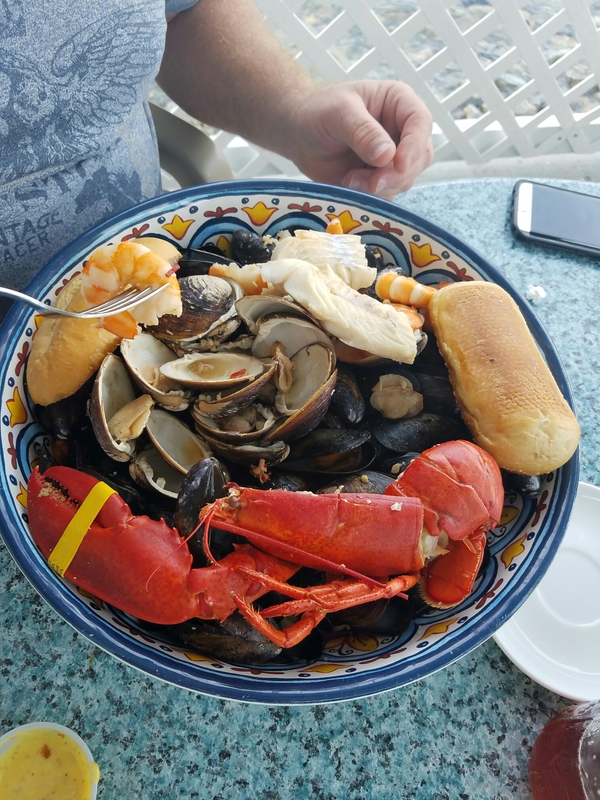 Ryan feasted on the Seafood Bouillabaisse which was a combination of fish, shrimp, mussels, clams, and lobster. 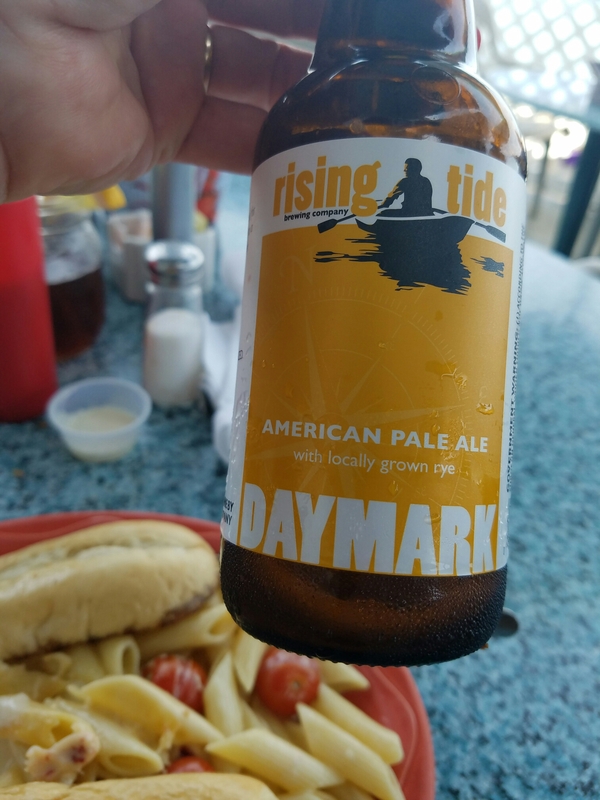 I rounded my meal out by tasting some of the local brews with the Rising Tide Daymark (I was told the restaurant is not at all affiliated with the brewery) and the Shipyard Summer Ale. We were so stuffed after our meal that we decided to walk it off along Old Orchard Beach. 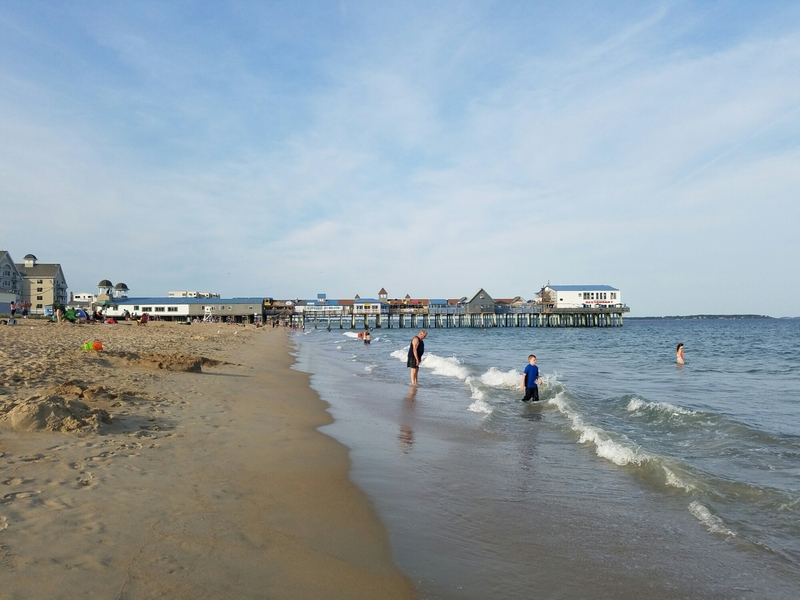 Summer was still in full swing here as we strolled down the beach watching families wrapping up their day of enjoying the sun, sand and surf. Beach umbrellas, folding chairs, coolers and sand castles speckled the shoreline around the pier. 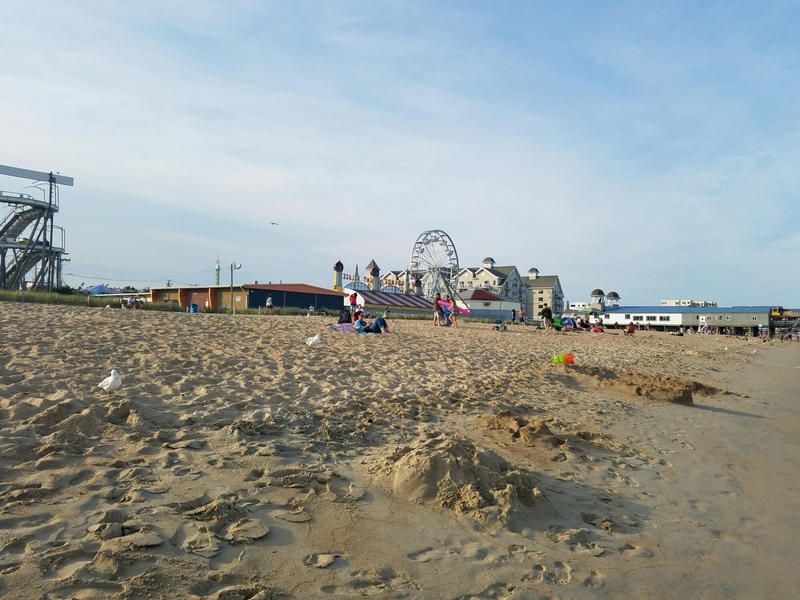 A cute little beachfront amusement park called Palace Playland was a throwback to our childhoods with its ferris wheel over looking the water. 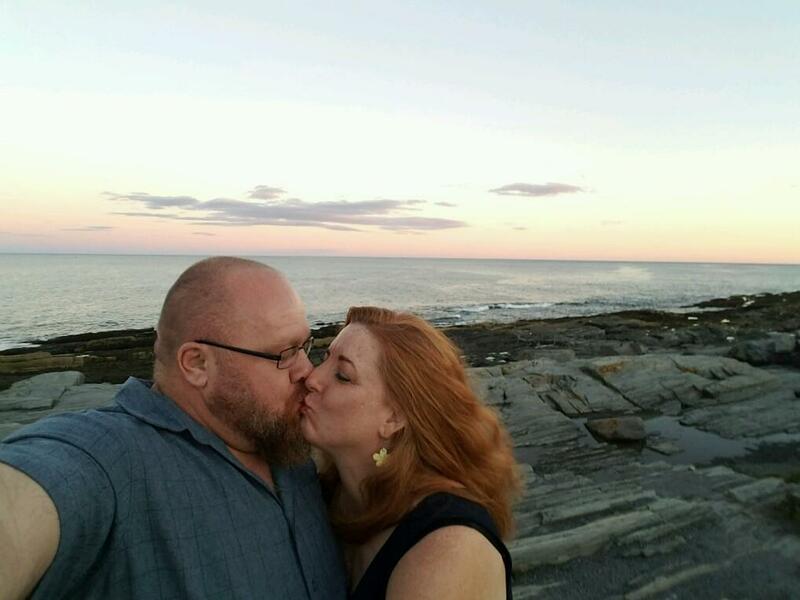 Day 4 of our visit to Portland, Maine was a truly special day as we celebrated our 26th anniversary. After sleeping in a bit, we set out for a nice brunch together. 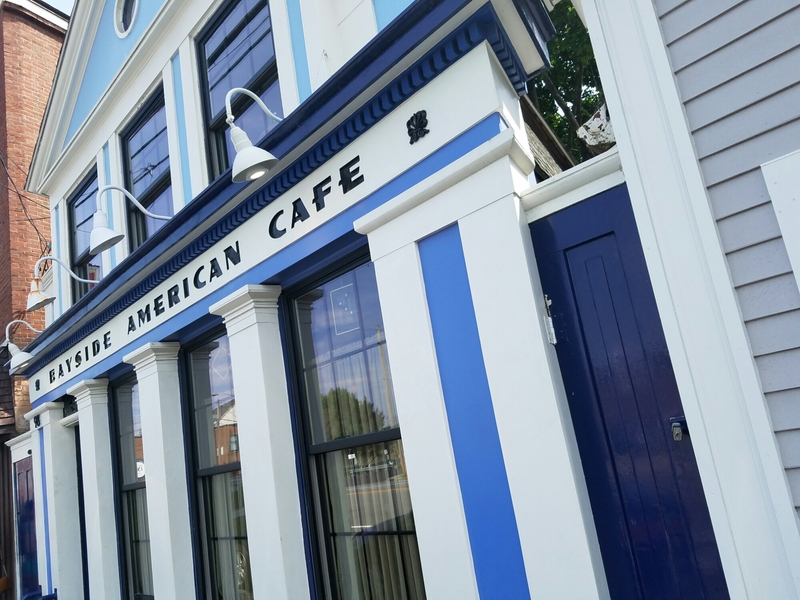 We found a cute little cafe on the edge of the arts district called the Bayside American Cafe. This old two-story building was full of charm. We sat outside on the 2nd floor deck, overlooking the garden. Because we were celebrating such a special occasion, a breakfast cocktail was definitely in order. The waitress was quick to recommend their Absolution, which offered fruity twist on a traditional mimosa. It was so good, it didn’t last long. 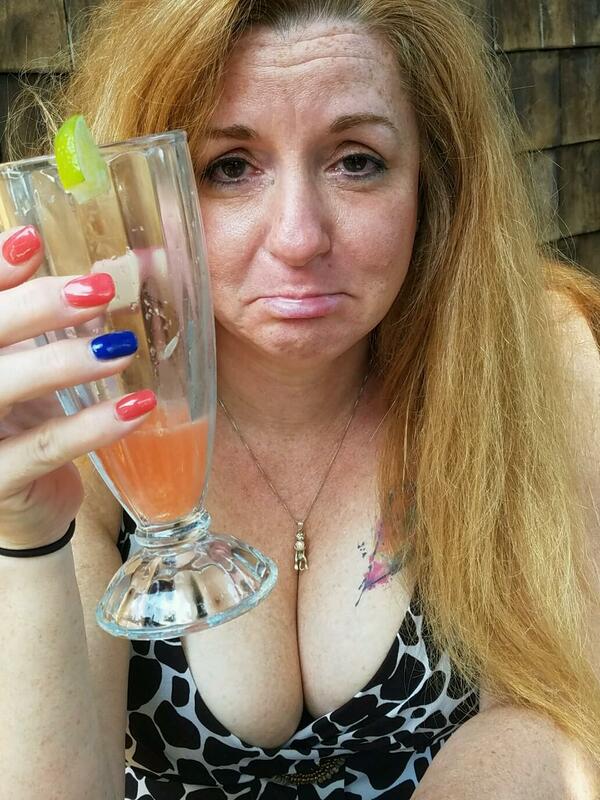 Where’d the rest of my cocktail go? Next up was the Honeymoon which combines Maine Mead Works honey mead with champagne and OJ for a sort of meadmosa. Let’s not let the cocktails overshadow the meal. Ryan must have been all lobstered out by this point, because he opted to make his own omelette, and I don’t think lobster was in the mix. But it looked light, fluffy and delicious none the less. I had the lobster benedict which was amazing! 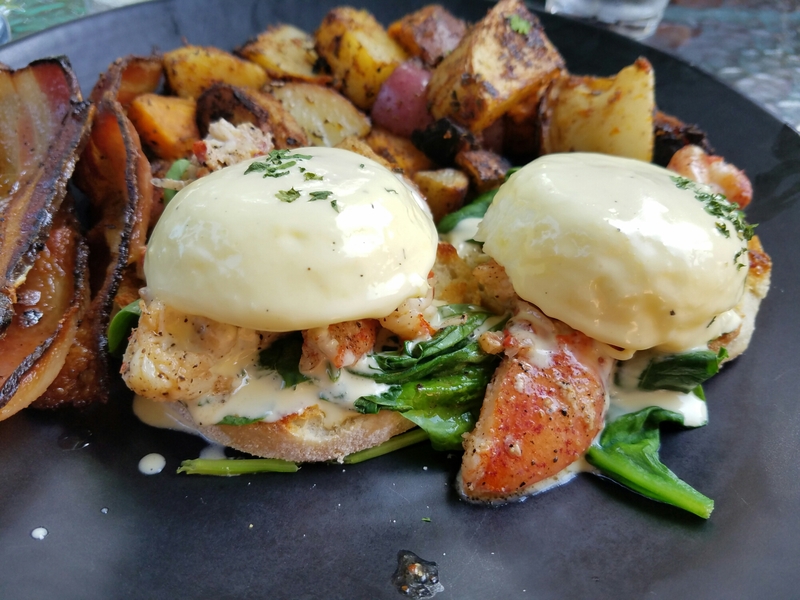 Just the right amount of lobster, sitting atop a slightly toasted english muffin, combined fresh spinach and with two perfectly poached eggs, then topped with rich, creamy hollandaise. It was probably one of the best benedicts I have ever had. We spend the early afternoon wandering around the arts district, visiting shops and galleries. We happened upon the Wadsworth-Longfellow house which was once home to the famous poet Henry Wadsworth Longfellow. 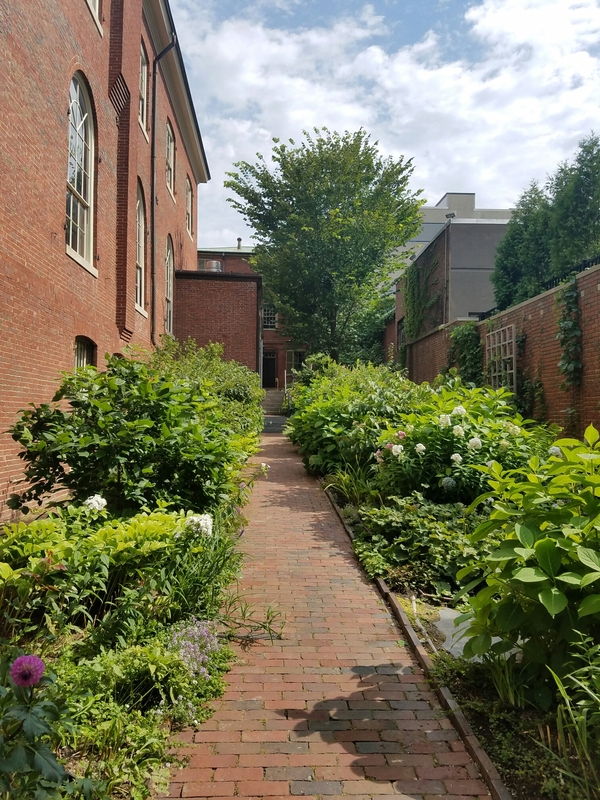 We weren’t able to take the tour of the home, but we did stroll through the gardens and take in the architecture of the home and the surrounding buildings. It was another warm sunny day in Maine, so as we headed back to Old Port, we stopped into Mount Desert Island Ice Cream for a cool, tasty treat. This place was certainly popular, as crowds of people packed into the tiny shop to place their orders. Their friendly service got us in and out fairly quick with a taste of their rich, creamy homemade ice cream. Their unique flavors definitely pleased our palettes as we continued on our way through town. Portland has a unique charm with it’s combination of old world meets modern-day, as some old buildings give way to new modern design elements. 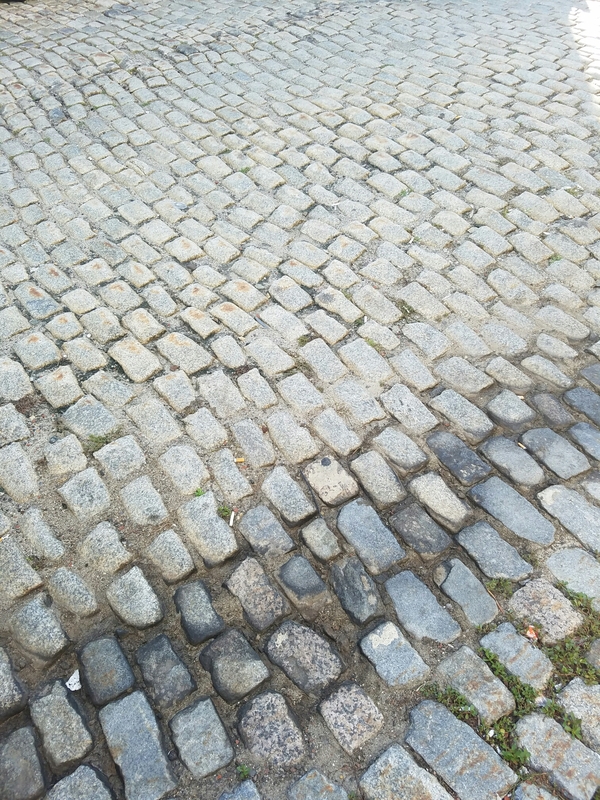 Charming glimpses of the past like Victorian style buildings and cobblestone streets remind us of Portland’s rich history. While newer buildings like the Portland Science Center look to Portland’s future as a tourist destination and cultural hub. Happy hour took us to Portland Lobster Company for cocktails and appetizers. Live music played in the background as we enjoyed a little snack and watched the boats on the water. 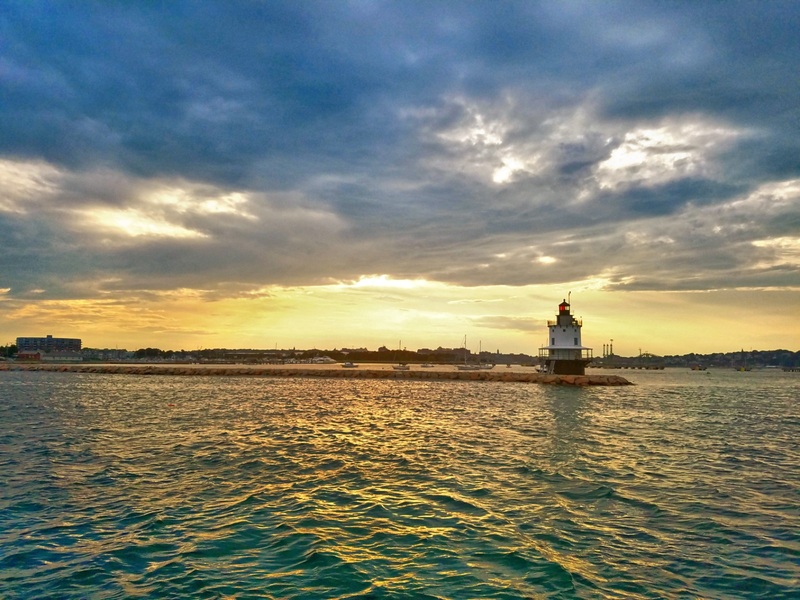 We booked a sunset cruise around Casco Bay with Portland Discovery Tours. When we boarded the boat, there were a lot of people and seating was scattered. We opted to stand on the top deck of the boat, as opposed to asking people to rearrange. In hindsight, I think we had better views that way. The boat took us on an informative tour of the bay, lasting a little over an hour and a half, where we were able to view the lighthouses, forts, and islands of the bay from the water at sunset. While the sunsets in Maine were nothing compared to the spectacular display of colors we enjoy in Arizona, the weather was perfect for an evening on the water. A cash bar was available, but after waiting in line once, I didn’t want to go back and miss any of the views. Following our cruise, we headed to Street & Co a rustic bistro hidden in a cobblestone alleyway, where our AirB&B hosts recommended that we enjoy a nice upscale anniversary dinner. While filled with rustic old world charm, we found the dining room to be a bit cramped and noisy. The food was delicious however, taking some of the classic seafood dishes we had been enjoying to the next level. I had the scallops in Pernod with cream, which was highly recommended by our hosts. I was a little nervous because the waitress described the pernod as having a black licorice flavor, which I am not fond of, but I decided to go for it anyway. The first bite had a very strong black licorice flavor, but after that it smoothed out and was quite pleasant. The scallops were seared perfectly and there was a good portion of them. Ryan had the whole branzino, which the waitress fileted at table-side for him. He even let me have a taste of it. It was light, flaky and delicious. 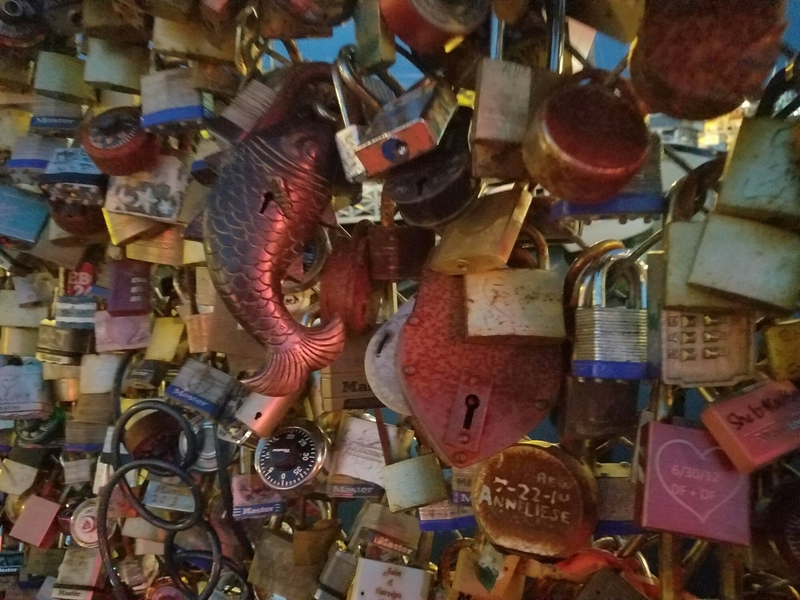 After our meal we strolled back down to the wharf past the love locks fence, where people hook padlocks of all shapes and sizes to a chain link fence to profess their love to someone, to look at the boats one last time before leaving Portland, Maine, and dream about one day owning one of our own. The joys of flying standby. Flight delays, mechanical issues and overbooking have delayed the second part of this trip. Unfortunately we ended up in Washinton, DC for the next several days and haven’t yet made it to Portland, Oregon. We’ll get there soon though, and when we do, we’ll share the rest of the adventure. Don’t want to rent a car on your next trip? Click here to sign up for Uber now and get your first ride free.